Yeah, sounds right to me…it’s the best Tarzan movie out there imho, but it could be a little bit better. Clayton is one of the worst villains Disney ever created. I don’t even mind that he is so obvious evil, but that Jane and the Professor overlook is bothers me to no end. Yeah that is silly of them. 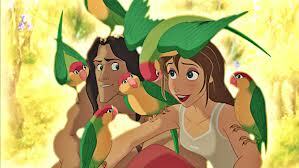 I just love the way it looks and I like Tarzan and Jane’s relationship. I love the lullaby so a solid B from me because I really do enjoy watching it, especially on blu-ray. Too bad the musical didn’t do better because I actually like it much better. The Blu-Ray version was good, eh? Well Disney Blu-ray’s could always be better as far as special features and such but it is one that looks gorgeous in high def! Both Mulan and Tarzan kind of show that a movie doesn’t have to be perfect for me to really love it. Mulan is a movie I like more with every passing year. I love this movie, but am not a fan of the songs, mainly because I don’t notice “background songs”. I like musicals where the characters actually sing. But, if you ask me to sing any of the songs from this movie, I have no idea how any of them go. I didn’t even know there was a Broadway version of ‘Tarzan’. The track I have on this review is from the broadway musical. I love the song and performance. I really like this movie, and I do think it is one of the better ones in the canon. I think the predictable argument could be used for almost every WDAS film, but this film is a bit more predictable than others. 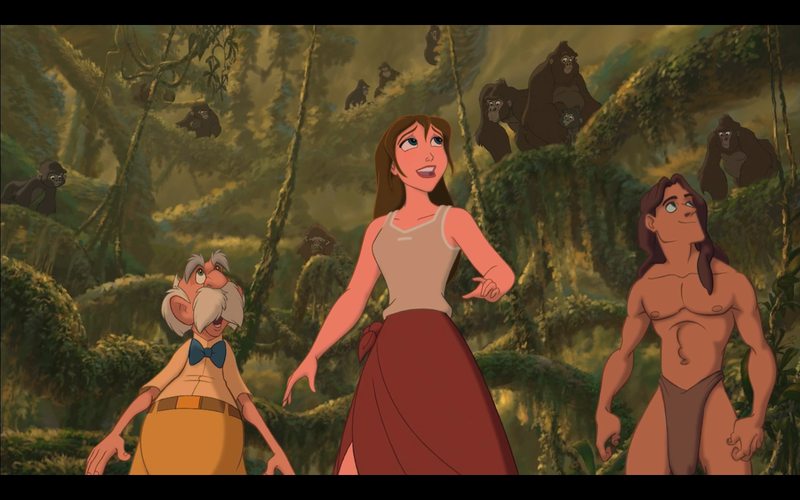 I like the relationship with Tarzan and Jane, but I think that it is a bit of a copout that most of their relationship takes place in the montage song. I like the songs, and the only annoyances I have with it is Clayton and Terk. It is a good end of the era. I forgot to mention the sound varies so much in this movie. I was constantly reaching for my remote to turn it up and down. That’s kind of annoying. Well, even though it’s not quite perfect, I give this one an A or A+ simply because of the awesome storyline and Phil Collins songs. Oh, and I liked how there was a lot of depth with the characters, especially the main one. Oh, and by the way, how shocked would you be if I told you that I thought Clayton was a good guy at first? Ha. Cool. It’s a very strong movie! I really love watching it. Me too! I don’t know, I guess with Clayton, while I could tell that villains like Shan-Yu, Jafar, Hades, Maleficent, Ursula, etc. were villains, I guess I didn’t really buy it at first with Clayton. That is despite the fact that he shot a lot of things even in the beginning. I guess I thought what probably some thought about Hans from Frozen, that Clayton was basically being a doofus good guy, you know? Oh well! I guess you have to have some twists here and there once in a while, eh? I can see that. I think Atlantis pulls off the twist a little bit better than Tarzan but when you have these villains whose soul motivation is greed and money like Radcliffe it makes them kind of boring. Scar or Gaston are more interesting because they have more motivations of a wounded pride, paranoia, disdain for others, revenge, lust for power etc. But I’m fine with Clayton. It’s not a huge stumbling block for me because it fits with the B movie campy style inherent with a Tarzan movie. Trashin the Camp and the side characters I could have done without and sometimes I wish they had let the characters sing a little longer. That’s why I like the broadway musical better. But it’s a very entertaining film. 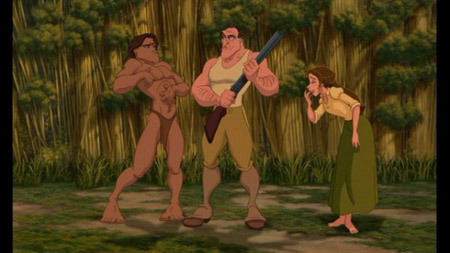 Agreed, Tarzan is definitely a very entertaining film. Yeah, I oddly enough thought the same thing about Rourke from Atlantis as well. To be fair, though, do you remember the scene in Atlantis where the group was discussing who should go and talk to Kida? Well, I think if you take a closer look, when Rourke says “Good man, Thatch! Thanks for volunteering!,” you notice that Helga has sort of a sinister grin on her face and maybe even Rourke as well. But I only noticed that when I watched it again for the first time in a long time about a year ago. I also noticed that when Helga says, “Commander, there were not suppose to be people down here. This changes everything.” Then Rourke says, “This changes nothing.” and then you notice that Rourke has somewhat of a sinister grin following that. Anyway, I don’t know, then how I didn’t see the whole Rourke being a villain scenario coming at first. Lucky for DJ Ilneige who does the video segment What We Had To Watch, he luckily enough saw it coming, or so he said when he was reviewing Atlantis. Just out of curiosity, have you watched his What We Had To Watch segment on YouTube? Well, Rourke’s soul motivation was likely for greed and money too? How then is it that you may not find him to be boring? Oh, and one more thing. Would you say Disney developed Clayton or Rourke more as far as villains go? Hey, I haven’t heard of that youtuber but will check it out. thanks for that recommendation. Rourke’s motivations are kind of lame but for most of the movie he seems pretty on board with the treasure hunt. To me he was less obvious a double crosser than Clayton which made his reveal more of a surprise. In both cases they fit the type of story being told pretty well. I don’t think either is that well developed but since Atlantis had Helga who kind of changes and grows and the rest of the team who you thought were going to betray Milo it is more interesting on the villain front. 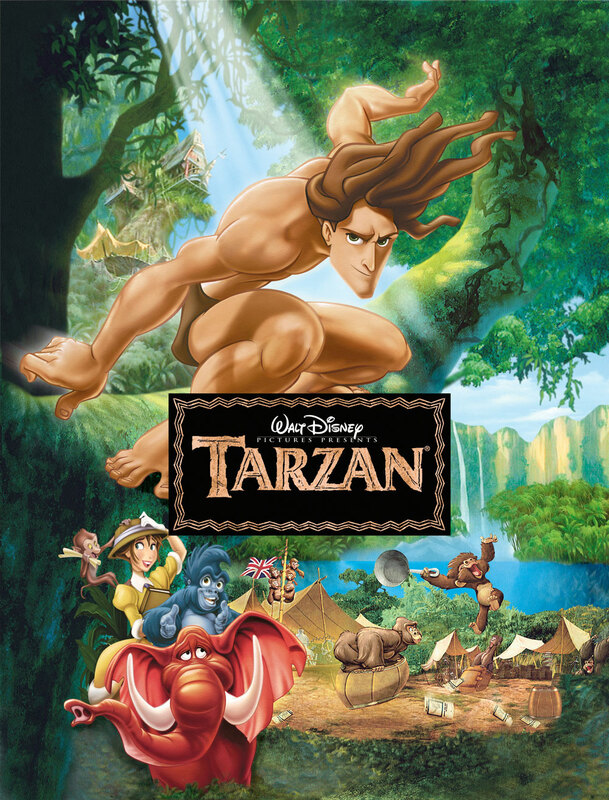 With Tarzan it is just Clayton and his motivation for gold. But in both cases I’d say it’s the other parts of the movie that make it work not really the villain. I like both films a lot. 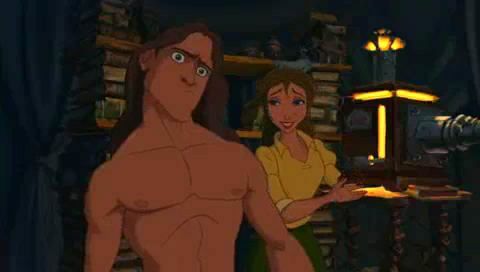 Mostly with Tarzan I like the chemistry and relationship between Tarzan and Jane. It’s one of my favorite Disney couples! Yes, they’re one of my favorite Disney couples too, along with others like Simba & Nala, Milo & Kida, Tiana & Naveen, Anna & Kristoff, and quite a few others. Also, I definitely like the Phil Collins. I guess it’s okay to have an artist singing most of the songs in an animated film, eh? Oh, and have you ever watched Lazerdude 99’s Animated Lookback series? He said that he wasn’t a fan of most of the songs in Tarzan since he felt like they were more montage after montage. Then, a few episodes later, he reviewed Spirit: Stallion Of The Cimarron and said that those ones for that film work better since they told Spirit’s story a little more. Anyway, for What We Had To Watch, you’re welcome! I don’t mind Phil Collins singing I just wish there was a little more of the characters especially Glen Close who has such a nice voice. My favorite couples aside from Tarzan and Jane are probably Roger and Anita, Ellie and Carl (if including Pixar), Ariel and Eric, Rapunzel and Eugene, Kristoff and Anna, Jasmine and Aladdin. I know there are others but my mind is blank. Roger and Anita are probably my favorite. That’s awesome! I have quite a few other favorite Disney couples too, but my mind is also blank. Oh well! Oh, just curious, did you know that Disney did the Deep Canvas thing on Atlantis: The Lost Empire and Treasure Planet as well? By the way, here are the links to a couple of What We Had To Watch episodes: http://youtu.be/60ly8YHpULE?list=PL0Cv84OTeDd54GKr6ukmVjtKp0WjZSw5 and http:youtu.be/LLx17GHVb34?list=PL0Cv84OTeDd57GK6ukmVjtKnP0WjZS5. These are the links to his Treasure Planet and Atlantis reviews respectively. Anyway, feel free to let me know what you think. Actually, the second link is http://youtu.be/LLxI7GHVb34?list=PL0Cv84OTeDd57GKr6ukmVjtKnP0WjZSw5. My bad. Awesome! Yeah, I guess the Deep Canvas was used for things like the Leviathan and a lot of shots on the island of Atlantis. That is according to the production portion of Wikipedia for Tarzan. Anyways, I was glad that You’ll Be In My Heart won an Academy Award for Best Original Song. Just curious, how did you feel about that being the case? For sure! I hope this film gets a re-release in theaters sooner or later. Btw you are my #1 commenter! Pingback: Most Romantic Disney Movies | Reviewing All 54 Disney Animated Films And More! 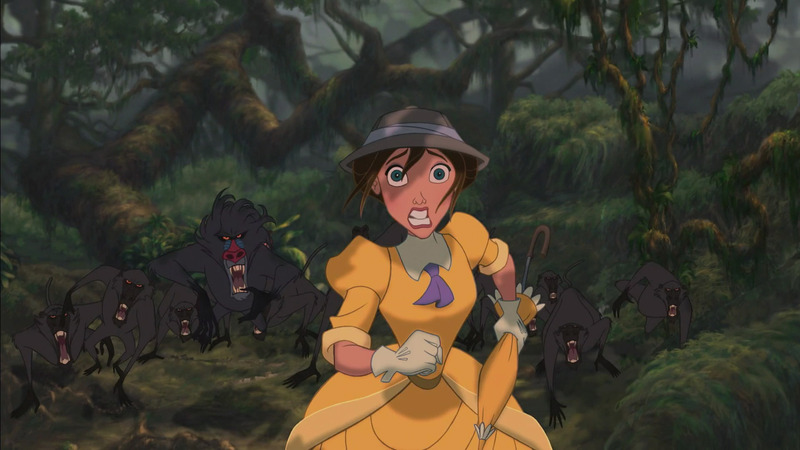 Tarzan’s one of those Disney films that I consider underrated yet at the same time, I don’t know if there’s enough to completely elevate it. If you don’t like Phil Collins or his songs for this film, then its a lost cause. Heck, even I wish Glen Close sung the whole of “You’ll Be in My Heart”. But, I still think the songs fulfill their purpose in allowing the visuals to tell the story. Still, flaws are evident in the side characters who don’t offer much, and the villain who I only remember because he’s voiced by ‘Flash Gordon’ thespian Brian Blessed. 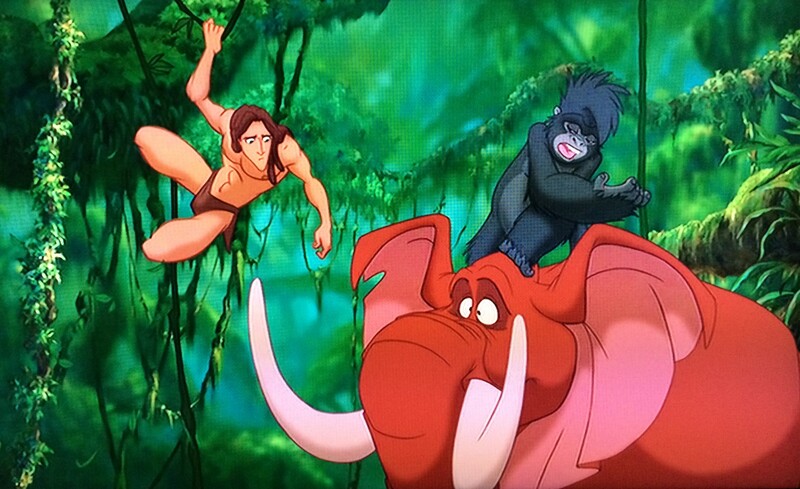 He could have been made stronger if the familial connection between Clayton and Tarzan was emphasized, as Clayton’s name is actually the surname of Tarzan’s father, even though the character himself is made up for the movie. 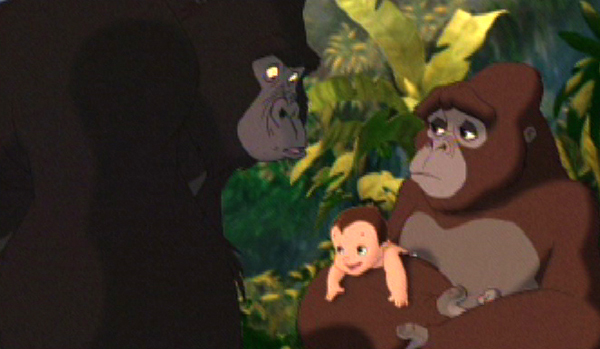 It could have raised an idea of true family versus false family if Tarzan’s human parents were named. Despite the missed opportunity, I do have a lot of affection for this film. I’m basically on the same page with you on this one. I really like a lot but definite flaws and I’d agree with all the flaws you mention. Some of the comic relief from Turk I could do without. Only good thing about the villain is it does kind of fit that type of campy Tarzan B movie of the 30s. And his death is gnarly but definitely lame. Still it is so gorgeous, I like the songs (but agree I prefer the broadway musical where the characters sing the songs) and I like the relationship of Jane and Tarzan. Thanks for reading my review. To me Tarzan is a perfect B not one of near perfect As but above an average C.
Recently we’ve had the new trailer for ‘The Legend of Tarzan’ hit. People seem mixed about it and compared it a lot to the Disney movie, but I actually am looking forward to it. It had the look of a classic 1800s jungle adventure, I like the cast they’ve gathered, it appeared respectful to to the Edgar Rice Burroughs material (with sensible updates), and it looked action packed, suspenseful and exciting like an Indiana Jones movie. This could be the live action Tarzan I’ve always waited for! 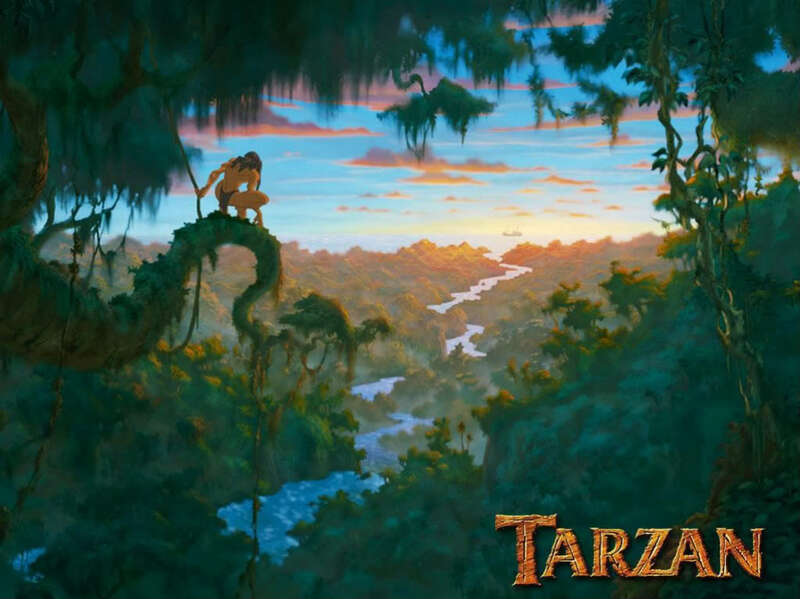 2016 looks to be a fairly crowded year for movies, but depending how it pans out we might have two or three movies set in the rainforest: ‘The Jungle Book’, ‘The Legend of Tarzan’, and ‘The Lost City of Z’, and these makes me more excited for 2016 than the newest batch of superhero movies! I know these are very old and I usually don’t comment because of that, but I just had to say this: Tarzan wasn’t raised by guerrillas. If he was, we would’ve had a completely different movie where he is an independent fighter. There would sure be a lot more guns and death, I think. 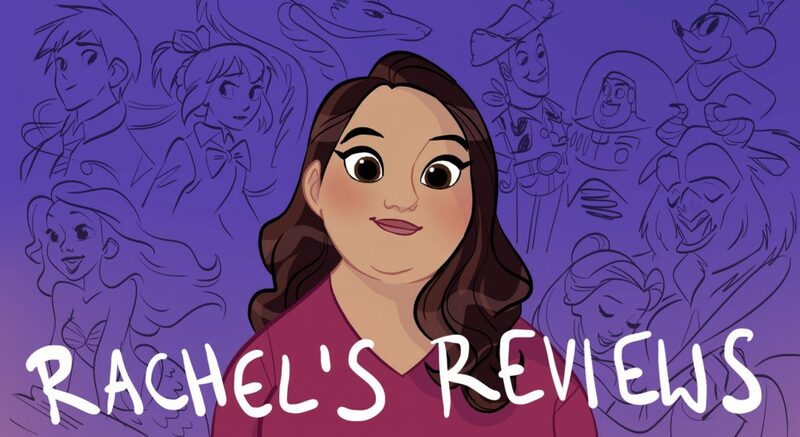 By the way, I love you reviews even though I usually disagree with most of them (like how can you not think Lion King is the perfect Disney movie?! That’s absurd! hahaha). You still explain your point of view pretty well and give a lot of cool insight into the movie’s production and release. I’ve been doing a Disney marathon for the past few months and I always look forward to reading your reviews after watching the movies!